This is a Belgian Wit beer and made for my wife!!! It is very similar to a Blue Moon made by one of those “evil giant conglomerate brewing companies”. A key difference with this batch is the absence of coriander. It does contain the zest of a grapefruit, locally grown, zest of lemon off of my tree and the zest of a store bought blood orange. Preliminary tastings while racking and checking the gravity have been very nice. Gotta wait 3-4 weeks to let it condition properly. The original gravity was dead on target and the final gravity looked good at 1.013. This batch will be bottled – I wanted to use my 6 liter Tap-a-Draft small kegs but they are out of business and I need parts! Dang! I added 3.6 ounces of corn sugar to carbonate at around 2.4 volumes. Bottling is tedious and sometimes a little messy, so, I will most likely mop the floor again. I do hope it passes inspection! Important decision before I start bottling – what should I drink to aid in the bottling process, my SMaSH IPA? A stout? No, too heavy. And the winner is……..
Yum…….. just one – Double IPA’s can sneak up on an unwitting and inexperienced beer drinker. I definitely have the experience part down several times over. Unwitting, well, I know the issue but sometimes that third or fourth IPA can cloud a persons judgement. The bottles have been sanitized and placed in a handy drying rack. I hope I counted correctly! Yes Haw – I had two bottles left over and about 6 ounces for a little taster. It definitely passes muster. I don’t always label my bottles, I distinguish them by the color or type of cap. I asked Kathy which one she would prefer but she deferred to me. My choice! Gotta love Ben Franklin! Waste not want not! I use recycled bottles, many consumed by me but I do get a little help from my friends. My supply is getting a bit depleted so I will need to gather up some before the next batch. I even recycle the 6 pack carriers. A couple of my favorites represented here. Bell’s Two Hearted Ale is awesome but their Hopslam is amazing! I was rushing and trying to get too much done before “Leaving on a Jet Plane”……. Peter, Paul and Mary was playing that song in my headphones just as that song popped up. I need to make a folk singer playlist…….. I know, this doesn’t have anything to do with beer brewing or consuming, but that is how brain works, or according to some, doesn’t work! The rush also translated into riling up my bees during inspection and adding a few supers earlier that afternoon. I took a couple of stings through the gloves and at the next stop I took two in my left bicep……looks awesome! Makes a nice peak when I flex. I mopped half the kitchen and left a few 5 gallon buckets drying on the counter. I hope my wife knows where I keep them! Get back on track now! Next, I think I will brew a double IPA or maybe a Pliny the Elder clone??? Maybe if I score some really good fresh hops a Hopslam kind of creation that is heavily dry hopped. Stay tuned I will get around to it in April …….. possibly. Finishing up a few days in Teddy Roosevelt National Park. There is a nice little brewery in Watford City called Stonehollow. Awesome beers! Drink Local and Drink Responsibly. It has been in the fermenter for almost a week now. One more week and it should be done. I brewed this all grain beer on one of the many crappy wether days that have been far too abundant over the last few months. Not horribly cold, but very wet. How wet? Nearly 20 inches over the past several months. Not any gully washer rains, but far too many wet days. Let’s talk beer and brewing. My SMaSH IPA, made with Mosaic hops and Marris Otter malt, is conditioning in the bottle as I Wait! Sometimes waiting is difficult. I now wanted to brew a beer that would match something that my wife would like! Brewing is good for her in that I manage to mop some and sometimes all of the kitchen floor during the beer making machinations. I found a very interesting Vanilla Cream Ale recipe and sent it over to Preston at the Grain Cellar in Humble, Texas. FYI, for non Texans, the “H” is silent in Humble. By the time I had arrived, Preston had reviewed the recipe and noted that he’d had all the ingredients on hand that I needed. As I visited with Preston, I notice on the chalkboard was listed a beer callled, Wife’s Wit. Well, I cancelled picking up the Cream Ale ingredients and went with the Wit. Preston tells me it is very popular and one of his most frequently brewed beers. I liked the grain bill and the additions, excepting the coriander! The citrus added an amazing aroma. The lemon was off of my backyard Meyer Lemon tree. The grapefruit off of a tree in a yard where I keep a number of hives. The grapefruit came off of a tree visited by my bees kept on the property. The orange, sad to say, was a store bought blood orange. Brewing day always calls for savoring some excellent beverages. First up……..
To the best of my knowledge I have never partaken in Strain G13, nor have I ever sampled this IPA. Although not winterish in Houston, I did go with a winter beer as the grains steeped. This is a familiar Ale, I last had one this past October while visiting Portland. Lastly, before all the work of boiling, chilling and racking into the fermenter, I enjoyed a non beer beverage. 2.65 fingers of Woodford Reserve Bourbon. In the background is tire with a little sleigh attached. In December my daughter drug it 13.6 miles, a half marathon, just because!!! After 14 days fermenting I will bottle this brew and then wait another 30 as it conditions….that will test my patience! I added a third Langstroth box at the end of the stand. It is now ready to receive it’s NUC on Thursday. Now, enjoying my SMaSH IPA! So, any guesses where I might be? City, county, state or state of mind? Search the photo for a hint! Another beer note, my Amber ale should be ready to bottle this weekend. Yee Haw, at the Crawfish boil On May 12th I will have my Russian Imperial Stout, my SMaSH IPA and my Sugar T—s Amber Ale. Could be an excellent day! Sitting on the patio enjoying an almost perfect Houston evening. It is about 74 degrees F or 23 degrees C for the rest of the world, a cold home brew in my hand and chicken on the grill. A small glass of my Honey Blonde Ale. My wife confronted me and asked if I was drinking “her beer”. I had to admit, “Yes dear, I am”. Chill out Hun – it was only 8 ounces! Insert smiley happy face here! I was using a brewery sample glass from Real Ale Brewing Co., Blanco, Texas. Sure was good! The chicken is smelling very good. @ $ 1.27 per pound!!!! whole roasting chicken cut in half. Season with Lowry’s and garlic. Yum! That describes the inspiration for my next brew, a Session IPA! Target ABV will be 4.6% or so. Hops, this is where I will get my thrills, 7 ounces of Mosaic Hops. Three of the seven will be used to dry hop the beer as it sits in the secondary fermenter. Six and half pounds of domestic two row malt, one pound of Munich malt, one pound of domestic wheat malt and a half pound of 40L crystal malt. Yes Dear Raspberry Wheat Ale is Primed! I carved out the time today to prepare. 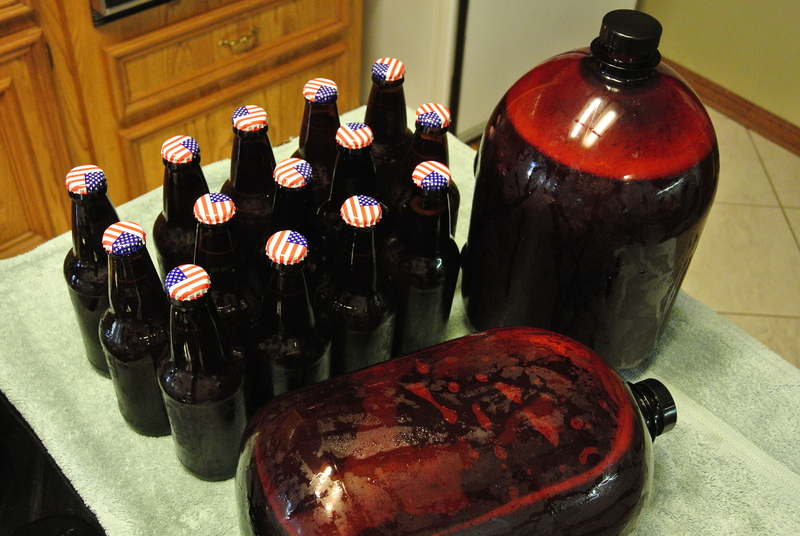 Most of the batch was going into two 6 Liter mini kegs, Iap-a-Draft to be exact and the remainder into 12 ounce bottles. As I usually do, I pulled a sample for checking the final gravity….I had no doubt that it was finished but….just checking. Damn – the hydrometer nearly floated out of the cylinder…..can’t be! How can it become more dense? It can’t – I pulled the hydrometer and the little foam pad was stuck to the bottom. Mystery solved. The chilled sample, 37 F, was 1.011 – plenty good to know that it was done fermenting. Final count, 2 – 6L bottles and 14- 12 ounce bottles. The taste test from the gravity sample was very nice…..I shared a sip with Mrs. Yes Dear and she agreed. Looks to be a success. Now I need to be patient and let it condition….10 to 14 days ought to be sufficient. 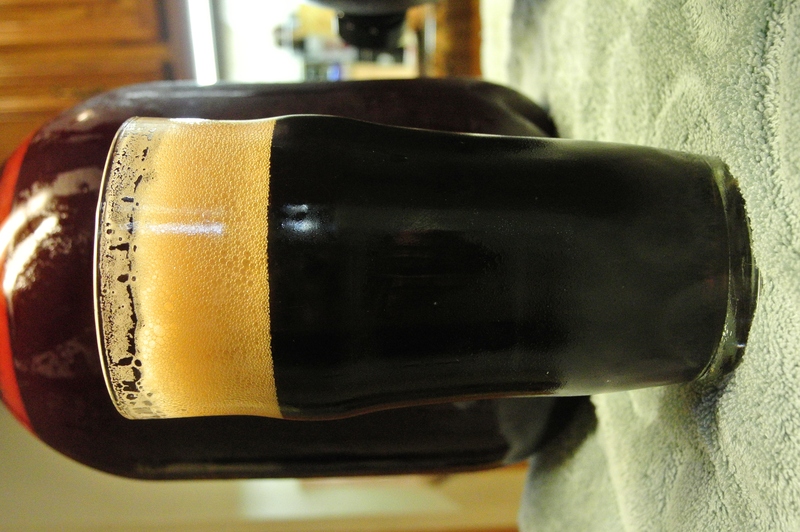 Normally, it is required to drink a homebrew while working on a batch, I failed to indulge. I have had a Bomber of Karbach Black Hopadillo IPA in the fridge for months now, just begging for my attention, so . Damn good! that is second use of the word Damn….I’m feeling a bit like Clark Gable!!!!! What is the next project? My son Ben is wanting a “session IPA”, lower in ABV but still retaining great hops bitterness and aromas. There are some decent commercial offerings that he enjoys. The simple approach would be to find a clone recipe but I think not….I think I may be able to improve on the clone!!!!! Stay tuned…more coming. The transfer is on…Sourdough starter in the left background. 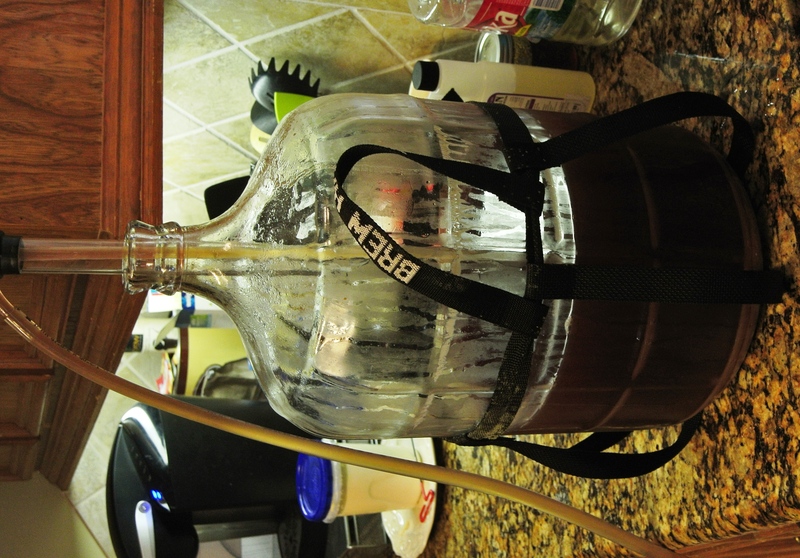 I love the carboy carrier straps…makes it easier and less likely to drop it. My bottled beer and the two 6L Tap-a-Draft bottles. The very nice Karbach Hoppadillo Black IPA. Nice way to end my task!